Martin O’Malley YOU are a disgrace. YOUR latest ad taking credit for passing Jessica’s Law is complete and utter bull$sh!t. In 2007, when a group of activists composed mostly of people YOU Governor O’Malley labeled “the aberrant strain” were fighting YOUR party in the legislature to pass Jessica’s Law, YOU did nothing. YOU merely signed the bill when it crossed YOUR desk. Where were YOU Governor O’Malley when House Judiciary Chair Joe Vallario rudely treated those who testified for the bill? Where YOU Governor O’Malley when Senate Judicial Proceedings chair Brian Frosh made supporters, including advocate Marc Klaas who traveled from California, wait five hours to testify then leave the room? Governor where were YOU when Frosh and Vallario were conspiring to kill the Jessica’s Law enhancement this past legislative session? 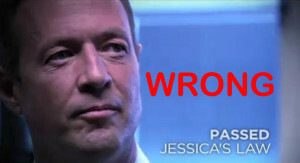 YOU, Governor O’Malley did absolutely nothing to help pass the enhancement. Also, Governor O’Malley how can YOU feature Lieutenant Governor Anthony Brown in the ad when it was Brown, as majority whip of YOUR party, sided with trial lawyers by twisting arms on the floor of the house to get enough votes for a procedural execution of Jessica’s Law in 2006? Governor O’Malley, I sincerely believe YOU to be an honorable man, and reasonable people can have fundamental philosophical differences without questioning their integrity. However Governor, YOUR claim to have “passed Jessica’s Law” now leads me to question YOUR integrity. Your ad is slap in the face to the grassroots advocates, who with No help from YOU, fought tooth and nail for Jessica’s Law against a recalcitrant majority of YOUR party to pass Jessica’s Law.